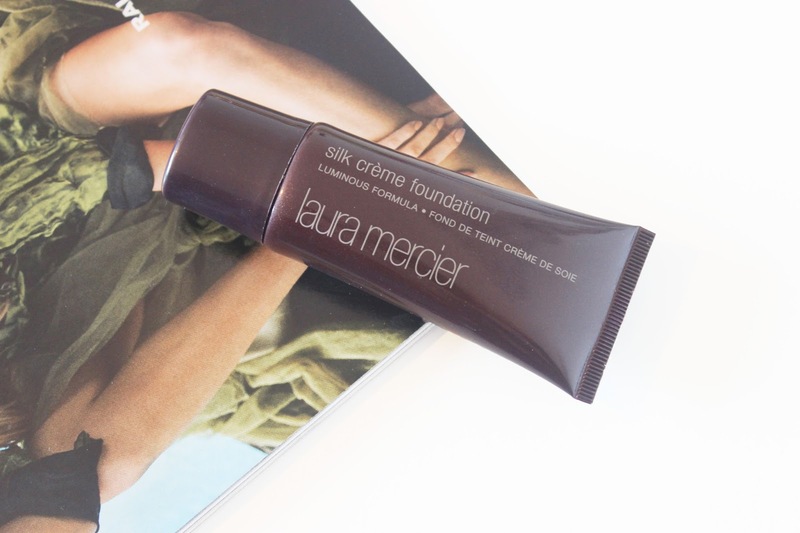 Laura Mercier is a brand that I have been dying to try for some time now, their Silk Crème foundation being top of my wishlist due to the hype and the promises of a long lasting, glowing foundation. Their sleek tubes and simplistic designs had me hooked from the get go and after spending an extortionate amount of time in Space NK, I came out with a massive grin on my face and a new foundation in my bag. Unlike many other high end foundations, the shade that I picked up - Rose Beige - is a perfect match for me, a shade which is suitable for fair to light skin with cool undertones. Even though it states that this foundation is full coverage, I'd still say it was medium coverage, but extremely buildable. The finish is a semi matte satin finish with a thick yet creamy and hydrating formula which blends easily into the skin whilst covering any marks, blemishes or imperfections. The only downfall to this foundation is that if you're in a rush or you're somebody who only has five minutes to do your make up in the morning then this foundation may not be the one for you as you definitely need to blend until your wrist hurts. What made me fall in love with this foundation is that it is long wearing with or without powder and it photographs beautifully because it is contains no SPF. I take a pea sized amount on my Zoeva 102 Silk Finish brush and blend until I'm satisfied, then I buff over my powder and set with my Urban Decay All Nighter Setting spray to make sure it lasts all day. Overall, the Laura Mercier Silk Creme foundation is definitely worth the hype and it's £34 price tag. I've worn it pretty much everyday and am pleased with the natural, glowing finish that it gives my skin. Have you tried this foundation? What are your thoughts on Laura Mercier? I'm relatively new to Laura Mercier having just tried the primer, but I've been really impressed with it and the foundation sounds amazing! Sounds so lovely and natural! I need to try this foundation asap, it sounds amazing! Never used anything things from Laura Mercier since I have no idea where to buy it in The Netherlands, but their products always get the best reviews! Just like this one, it sounds amazing! I've been dying to try out some Laura Mercier products too! Thanks for a really informative and helpful post, and you've got a gorgeous blog! I still haven't tried anything from Laura Mercier I keep meaning too! I really want to try a longer lasting foundation but this one is way out of my price range at the moment. Such a shame because it sounds like such a great product. I really want to try this brand, I always see such good things! I haven't ever tried anything from this brand before! I think I will have to now! I've been meaning to try this out for some time. Great review! I adore LM, their foundations in particular and are so underrated. But then its almost like I don't want anyone to know! Great review Lily! I love Laura Mercier foundations. I currently use LAURA MERCIER OIL-FREE SUPREME FOUNDATION and it's amazing. I have to try LM creme silk foundation. Sounds like a great product. Absolutely adore Laura Mercier! One of my favourite brands. I've yet to try out this foundation, so will most definatley give it a try. Especially as it has a hydrating formula. Love products like this.